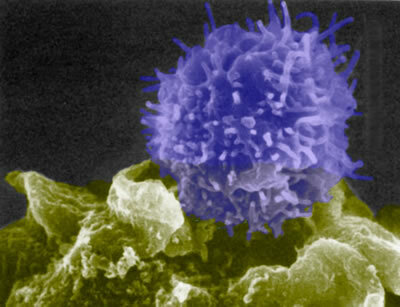 Interaction between a T-cell (purple) and another cell of the immune system. The ability of a common virus known as CMV to cause a “superinfection” and infect humans multiple times has puzzled scientists until recently. Researchers at the Oregon Health and Science University Vaccine and Gene Therapy Institute have reported the mechanism that CMV uses to evade the immune system and re-infect humans, in a study published in the April 2nd issue of Science. Their findings shed light on how this virus may be used in the development of CMV-based vaccines for other diseases. Cytomegalovirus (CMV) does something that not many viruses can do: it can re-infect people who previously have been infected by CMV and have already developed an immune response to the virus. This is unusual for a virus, because the immune system usually “remembers” previous infections with viruses and other pathogens and can mount a strong immune response upon re-infection with a specific pathogen. The researchers studied CMV-infected monkeys in order to understand how the virus overcomes detection by the immune system. They discovered that CMV avoids a special type of white blood cell called CD8+ T cells, which are responsible for killing cells that are infected with a pathogen. CD8+ T cells recognize infected cells by small molecules on the exterior surface of infected cells known as MHC I. These molecules display small pieces of an invading pathogen and present them to the T cells. This presentation of infectious material ultimately signals T cells to start destroying infected cells. In order to evade these T cells, CMV makes proteins that interferes with the presentation of viral pieces by MHC I molecules and stops them from recruiting T cells to infected cells. “In essence, CMV is able to cut off an infected cell’s call for elimination. This allows CMV to overcome this critical immune barrier during re-infection,” explains author Klaus Frueh. The study has interesting implications in the design of CMV-based viral vaccine vectors. Viral vaccine vectors contain a modified, harmless virus that carries a vaccine for another pathogen to the body. Although the body develops immunity to the pathogen, it also develops immunity to the viral vector, which means that the viral vector can only be used for one type of vaccine. Since CMV does not elicit an immune response upon re-infection, it makes an attractive vaccine vector candidate that could potentially carry vaccines against other pathogens, such as HIV, hepatitis C, tuberculosis, and malaria. CMV is a member of the herpesvirus family and infects 50-80% of the US population by age 40. Most people do not have any symptoms of CMV infection and do not become ill. But for those with weakened immune systems, including infants and the immunocompromised, CMV can cause serious complications. With this new understanding of how CMV evades the immune system, scientists may be able to start utilizing the virus for the benefit of human health.